Shamelessly pilfered from @playupfootball (give ’em a follow on Twitter if you’re that way inclined, they’s funny chaps). easily the best fans in the world. we’ll miss u guys! Irish fans are just legends! ireland (or more specifically irish fans) have really created a good name for themselves from this tournament i reckon. kudos. I really don’t get this ‘best fans in the world’ spiel. 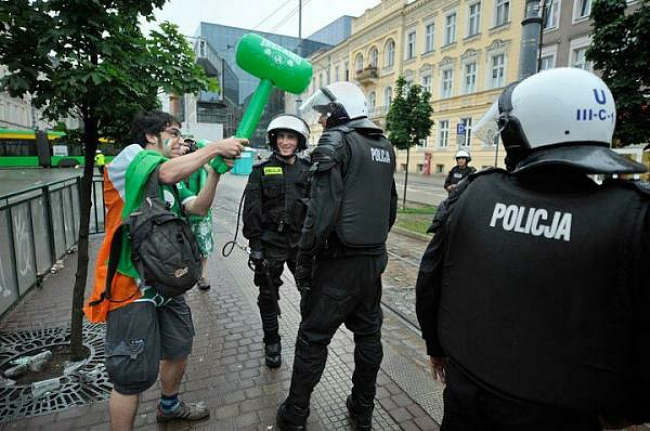 HAHAHAHAHA look he hit a policeman on the head with an inflatable hammer, only the Irish! Am I missing something? Yeah – other fans would use real hammers! Oh and they wouldnt have the tooled up police laughing with them. It seems an entire nation is only famous for being drunk and having a laugh. @foran44 Yeah I saw it. Lots of fans do that. There’s not really much you can do when you’re getting whooped and you’ve lost all your games. It’s almost as if they revel in and celebrate mediocrity. The funny thing is they’ll all go home and put on their Man U or Liverpool shirts.